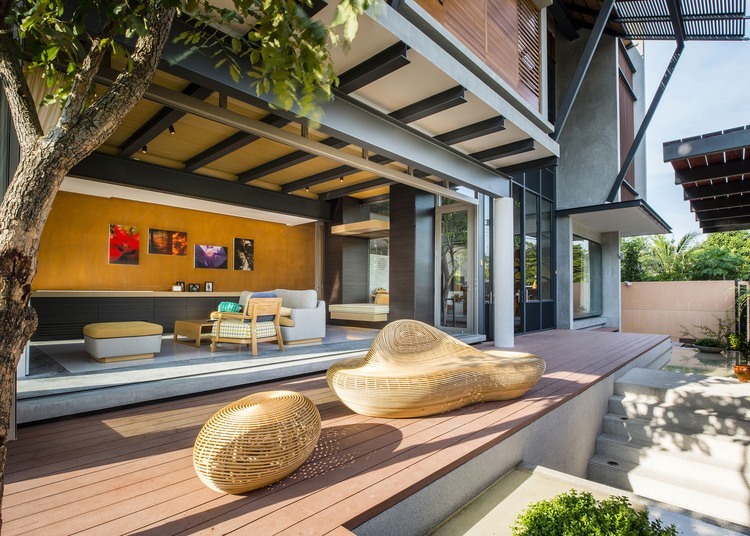 Situated in Nonthaburi, Thailand, this modern 4,843 square foot residence was designed in 2013 by TA-CHA Design. Spanish architects Josemaria de Churtichaga and Cayetana de la Quadra-Salcedo have built themselves a rural retreat with wooden walls, projecting terraces, and a brilliant yellow door and chimney. Four Seasons House is located approximately 100 kilometres north of Madrid. This awsome apartment located in Paris is a masterpiece, full of design and unique elements. The central point of living room is an amazing curvaceous couch. This house designed by Ukrainian designer Igor Sirotov is located on the Black Sea. He had used a concrete and glass extensively, creating a modern home, but still very close connected to nature. Such designing idea references japanese residential architecture through its use of materials and its close relationship with nature. This beautiful modern apartment has been designed by German interior designer and stylist Peter Fehrentz. He has cerated an interior with unexpected beauty, full of unique marvelous decors. Using a color scheme of dark hues — eggplant, charcoal, black and pink, Fehrentz has transformed a sunless, tiny roomed dwelling into an open-plan light and airy modern home. This modern cubic house has been designed by Luis Aldrete and is located in Zapopan, Mexico. Maison Escalier (Stairs House) imagined and realized by Paris-based architects Jacques Moussafir. Fully glazed facade is dressed in a metallic second skin pattern plant that protects the privacy of the occupants.The facade is entirely glazed and outfitted with electronically controlled patterned steel shades that paint shadows on the interior when the sun filters through. This Riverdale loft project is designed by Beauparlant Design in Toronto. The architects completed the remodal of a loft in a former printing press factory.